Do you have issues with your teeth that you wish you could fix with a relatively simple procedure? If you do, then you might be in luck, and it might just be time to talk with your Woodbridge dentist about dental bonding and whether it is right for you. There are plenty of great options and features when it comes to cosmetic bonding. The dentist will attempt to match the color of the resin used to your natural teeth, and he or she will use a shade chart to do this. Once they match the color, they can apply the dental bonding to your teeth to help deal with a variety of cosmetic issues, as well as other issues that affect the health of your mouth. What Types of Problems Can It Fix? Dental bonding tends to be an inexpensive option for those who need to correct cosmetic problems with their teeth. It generally takes just a single visit to the dentist, and you rarely need to have anesthesia. Something to note though is that if you later decide to have teeth whitening done, the surrounding teeth might get whiter, but the bonded area will not. After getting the bonding, continue to take care of your teeth as you normally would with brushing and flossing. 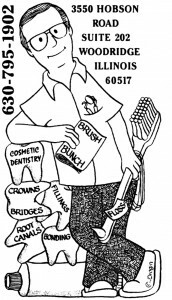 You can visit your dentist in Woodridge if you need touch-ups. If you would like to know more about dental bonding, it is time that you contacted our cosmetic dentistry specialists in Woodridge. You can get in touch with us by calling 630-795-1902, or by visiting our online contact page. Visit us at Machnowski, DDS today!